Fr Michael Murphy has been declared Kerry Person of the Year 2014. The 88-year-old priest, who has been an inspirational figure in the Tidy Towns movement, was a thoroughly deserving winner of the award at an announcement at the Killarney Park Hotel on Monday 13th January. Fr Murphy is affectionately known throughout the country as ‘Father Tidy’, and is still actively involved in an organised, voluntary litter-collecting programme in Killarney. 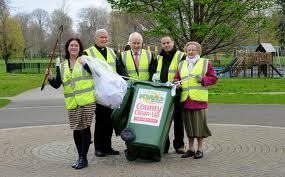 In the past he has helped lead Sneem (1987), Kenmare (2000) and Killarney (2011) to the top Tidy Towns prize. The award was presented by the Dublin Kerry Association and Archdeacon Murphy was nominated by Killarney Looking Good/Tidy Towns. He is a brother of retired Bishop of Kerry Dr Bill Murphy.